No need to worry about the analog video images fade as time goes by! 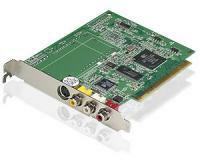 DVD EZMaker PCI Deluxe turns moments caught in any analog video signals into a full DVD or VCD! This PCI interface capture card can connect with your PC and home video devices such as DV, V8, VHS, DVD Player and VCD Player, and easily digitalize analog video onto your hard disk! With a built-in advanced Hardware MPEG-2 encoder, DVD EZMaker PCI Deluxe can capture video without spending much CPU resource by hardware compression. It enables you to create personal menus, and edit video clips on a storyboard easily. You can also import your favorite videos, and organize, edit, highlight video clips on a storyboard to create your personal movies. The capture card provides a "Direct-to-disc' function to record video from a DV camcorder to DVD without writing to the hard disk buffer first. Just click one button to simultaneously capture and burn your analog video to VCD, SVCD or DVD! The bundled software supports DVD VR formats so you can re-edit the previously recorded video and re-burn it onto the same DVD. Direct-to-disc allows to record video from a DV camcorder to DVD without writing to the hard disk buffer first. Arrange, organize, sequence and add/delete video clips on a storyboard. Offer a wide selection of editing features and deliver top-quality scene transitions. Support different production formats of DVD, VCD, SVCD and editable DVD.